AWWWWW! The coolest thing ever! Creepy Snowman is touched and honored! And so am I. Congratulations on 5000! Cripes, that is fantastic – well done. Your blog is original and very well done so I am not surprised that it is popular. Also, I notice that I am on that mosaic! Thank you. I am completely amazed and totally honored to be included in your line-up. Congrats to you, 5,000 ain’t nothing to sneeze at! I love your stuff! Looking forward to the next 5,000! Wow, 5000, that is amazing! And incredibly well deserved, you have a wonderful gift. I am honoured to be included in your fantastic avatars. Thank you! Congratulations! 5,000 , that’s incredible, and what a wonderful and warm way to celebrate. I can’t tell you how surprised I was to see me and Avery there! We are both so honored.And to think, less than a year ago our Avery had never even been outside, then alone in cyberspace, and now look at her nearly famous thanks to you. yours is so cute Lori-Ann! Thank You. Your’s is wonderully whimsical don’t you think? That is amazing! I recognised so many blogs I follow from your gravatar handiwork, they are so awesome. Congratulations on 5000! Congrats! Those avatars are so cute! It’s incredible! You totally deserve it!!! Congratulations! How I aspire to those lips! I’m heading to the makeup counter right now! Congratulations on 5000! As the oldest of 5 girls myself I find your blog to be delightful. I think my favorite is the rule that allows the oldest to ride in the front seat!! And I was even more surprised to find my avatar among them! Thank you so much for doing that for us, I it’s very nice to be appreciated, and amazing to be turned into works of art. Wow! I am so impressed that a) you have 5,000 followers, b) that you took the time to re-create 50 gravatars and c) that you included mine (thanks!). You deserve the success! Yes, isn’t it great! I was so amazed Nicki took the trouble. What a lovely appreciation of her readers! Oh isn’t this the most divinely awesome thing that you are doing for your readers! What effort! I was so absolutely, insanely and fantabulously oversjoyed to see my gravatar! I could recognise it instantly! Thank you so much! You art, humour and wonderfully (sometimes wickedly wonderful…actually oftentimes wickedly wonderful) story tell gift makes my day! I love reading the blogs of other creative artists, whether they are story-tellers, photographers or painters. They inspire me in my own creative process. The Middlest Sister is one of the most insanely cool, and wickedly funny blogs I know. I look forward to reading every post. It is a marvelously creative blog that tells the growing up stories of 5 sisters through craft paper cut-outs. The blogger is the “middlest” of the 5. It often amazes the me how she is able to mimic expressions and activities in life. I always feel happy when I read the antics of the 5 sisters. Today, The Middlest Sister celebrates its 5000 subscriber mark and rewarded its 50 most active readers with a special paper cut-out of our gravatar. I was tickled pink to see my gravatar in paper (a few pink and purple cosmos flowers). Thank you, The Middlest Sister! ahhhhhhhhhhhh! i love it so much!! congrats on reaching 5000 (your fans know it’s only going up), and thank you for the coolest avatar ever! Sorry I couldn’t do everyone’s! As it was, making 50 of them took about 25 hours of work! Wohoooooooooot! Big congratulations for reaching the 5.000 miles stone! You really deserve it! And thank you so much for making my avi! I might just have to swap to that one! Brilliant! That is sooooo awesome! :D How fun! This totally made my day! Do I have permission to steal mine for personal use purposes? Congratulations! That is a wonderful achievement, well deserved, and an ode to Good Taste in humor. Continued happy memories of growing up, and sharing your stories with us. It is no surprise you have such a following, its well deserved Nicole !!!!! Randomly selected or not, I feel like a cartoon rockstar – thank you ! Holy Wonderbutt! Congrats, and you totally deserve 1,000,000 times that! What a wonderfully creative way to thank your commenters. Your imagination never ceases to amaze me! Oh my God, I love it so much I want to cry! I love that I can recognize so many on here. You are so talented that I am not surprised one bit by your 5,000 followers! Thank you so much for including me in here! Wow! I love all of the cut-outs (especially Peg-o-leg). Now, I have to go click on all of them just to check out your artwork. Thank you and congratulations! For someone who is supposed to be “looking up,” I have been doing a lot of posting lately. I loved The Middlest Sister’s tribute to some of the bloggers who visit her site, so I wanted to share it here. Awwww… thank you! I feel so honored! You have made my week! You are incredibly talented! Your blog is such a wonderful delight; I always become extremely happy whenever I receive the email about a new post. I can hardly wait to read your book! I wish you much more success, joy and happiness because you deserve it! You have made 5000 people really, really, really happy! Holy Smokes! This is the best gift I’ve received EVER! I’m totally showing this off! Thank you so much! You deserve so much more success and I hope it comes your way times ten!!!!!!!!! Did you see it? If not click on the entire post! 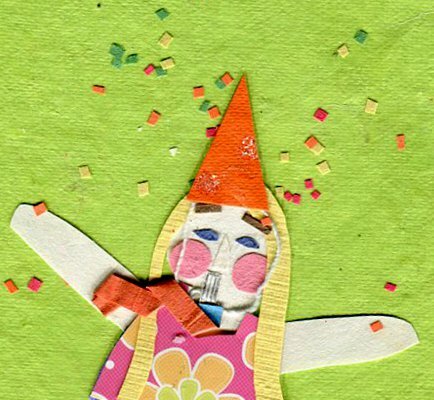 Not only is this the most wonderful artwork and creative site, but she made a paper artwork avatar for scatteringmoments! I am so freaking tickled!!!!! So thoughtful and lovely. You are quite a talent. This has got to be one of the absolute best posts EVER. Of the blogs I read I easily picked out their cutouts here. Great job! These were all amazing! Congrats on 5,000!! Congratulations! 5,000 is quite remarkable. I love the gift of the avatars. They are incredible and I have been matching them up with the real ones. I’m so pleased to see mine included. These are just making me giggle like a little girl. Thank you. Congrats on 5000!! What a well-deserved accomplishment. No less of an amazing feat was creating those 50 avatars. Thank you so much for including me in that bunch. I LOVE IT!!!! This is the coolest thing ever! I can’t believe you spent 25 hours making this. Thank you. It was so neat to scroll through and see all the bloggers I know. And you do such a great job that people can actually tell who those avatars are without clicking on them. And thank you for including me. What fun! Your talent never ceases to amaze me. Congrats on 5,000! This was such a cute idea! Congratulations on 5k! Congratulations! You deserve the 5,000, and lots more! This has been a consistently hilarious and creative site, and I’m extremely proud to be one of the top 50! I totally didn’t expect to be in there, and that is such an awesome cut-out of my avatar! What a lovely way to honor your readers! Well done and congrats! What a great idea! They are all so well done too!